This photo shows a general view of the courts prior to the 2017 renovation project. For more archive photos and videos, please click on the relevant tabs above. The beginning: Aboyne Tennis Club was formed in the early 1900s, with two courts located at Formaston, near the current Aboyne golf course clubhouse, which itself was formed in 1903. Relocating: the tennis club moved to its present central village location in 1925, with four courts built on land donated by a Mr Mearns. In the same year Herbert Lawford was buried in the Aboyne St Thomas's Church graveyard. He was a former Wimbledon men's singles champion in 1887 (and is thus the first name on the present trophy) who lived in Dess and invented forehand top-spin (known at the time as the 'Lawford stroke')! Fallow years and re-opening: the courts fell into disuse after the second world war and were apparently planted with conifers! Some enterprising individuals restarted the club in the early 1970s, apparently using the income from the felled conifers to pay for clay courts to be laid. In 1985 all four courts were converted to a more durable "porous concrete" surface to reduce maintenance effort and costs. This was a wise move, as they lasted an impressive 32 years without the need for a major relay. Clubhouses and initial floodlighting: the original Tudor style pavilion, shared with the Bowling Club, had become too expensive to repair and was pulled down in the early eighties. The tennis club did not have funds to contribute to its replacement, which is the modern building used as the bowling clubhouse. However with a pick up in membership and help from the National Lottery, the present wooden cabin-style tennis club house was constructed in the millennium to replace the caravan, which acted a clubhouse for a while! Around the same period two courts were floodlit for the first time, using second hand football floodlights. These were cheap, but proved quite challenging to use for tennis, with glare being a particular problem. 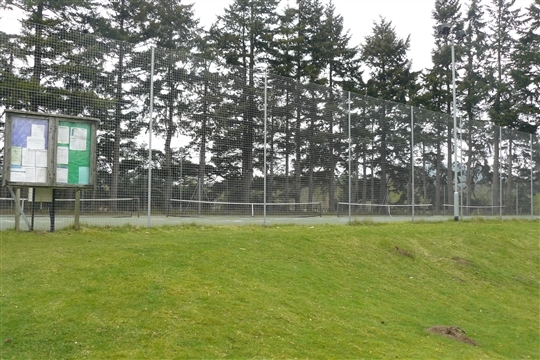 Major renovation: by 2017, with more 200 members after a period of strong growth, a project was desperately needed to fully renew the obsolete and crumbling court facilities, which were being badly damaged by the roots of the now enormous Douglas Fir trees adjacent to the perimeter fencing. A £170,000 project was carried out in July - October that year in which the trees were removed and the courts were re-laid with porous tarmacadam, painted in Wimbledon purple and green (with a nod to Herbert Lawford). Low energy, high quality LED floodlighting was also installed on all courts, hugely increasing the amount of year-round tennis possible and supporting the club's future development as an important hub for tennis in West Aberdeenshire.